- Extract some localized item strings using Blizzard API. - Various small tweaks on section layout. - Order sections by total available space instead of number of items. - Fixed the priority of the ItemCategory filter. - Added AceGUI and AceConfig as externals. - Added a first batch of options. - Added some tooltip on bag header widgets. - Merged and moved some files. - Tidied module enable/disable code. - Added a module to tidy bag contents. - Added an API to inject a widget in bag header bar. - Postpone any button update while the container is being updated. - New item tracking ported to the new modular system. - Each bag is now handled by a specific module, that adds a level of abstration above container frames. - Added bag anchoring so one can move the bags, using LibMovable-1.0. - Cache slot data to allow a better tracking of stack size changes in addition to item changes. - Added LibDataBroker-1.1 as a git submodule. - Prepared for wowace packaging. - Try to put the "New" section at top of the bag and the "Free space" section at bbottom; the section layout code may ignore this though. - Fixed search item issue where some buttons weren't updated. - Added a filter for the new items. - Added a button per bag to reset the new status. - Scan player inventory to avoid tagging items as new when changing equipment. - Cosmetic tweak to new item glow. - "New item" feature tweak. - Fixed a "comparing number with nil" error. - Added "new item" feature. Also got rid of useless "event" arguments. - Overhauled filter system; now every filter is a submodule. - Hopefully fixed "addon blocked" errors; cosmetic changes. - Use AceEvent messaging to propagate bag updates. Filters can provide a list of events to listen to; bags are updated when these events are received. - Hopefully fixed issues with bank generic buttons. - Added missing localized string. - Almost fixed bank generic button handling. - Fixed a typo on filter name. - Force layout update when a section is emptied. - Disable the built-in bank frame. - Say goodbye to the bank NPC when the bank bag is closed. - Have virtual item stacks working. - Use a factor of 100 to build internal slotId; it's far easier to debug. - Moved code around, added comments. - Properly release empty section. Also stop reacting to BAG_UPDATE during equipment set switching. - Do not try to position new buttons when the layout will refreshed anyway. - Hide frame before calling :OnRelease to reduce visual glitchs. - Gave OO some love. - Brand new layout code, which behaves nicely when moving items around. 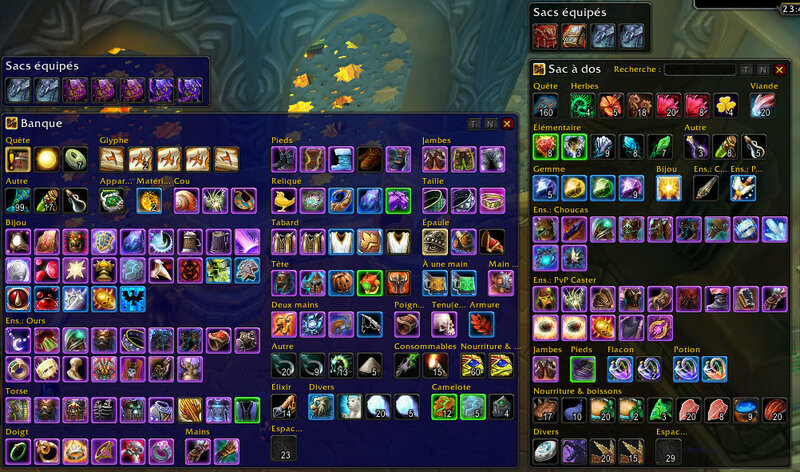 - Added a tooltip to the equipped bag toggle. - Fixed bag slot size and ids. - Added a button to bags to toggle the bag slot panel. - Updated the datasource icon. - Added bag slot panels. - Reuse Blizzard code to handle item cooldown. - Fixed armor and weapon ordering. - Added section separators (yet not widgets). - Added an incomplete filtering system. - Fixed datasource free space display. - Fixed item sorting error. - Added "highlight by name" feature. - Added icons for each item family. - Added item/free slot stacking. - Added a LDB data source. - Fixed quality color display. - Fixed UI hooking so bags are opened and closed at right times. - Added a close button and a title. Enhanced item sorting. - Show a tag on slot from special bags (Soul, Quiver, ...). - Fixed bank background color. - Have the bag backdrop catchs mouse events. - Fixed issue with empty bank slots. - Fixed bank bag position. - Fixed empty slot display. - Fixed ContainerFrame BAG_UPDATE handling. Also propagates it to buttons. - Do not forget to define the ID of the button parent frames. - Fixed frame parenting show items are properly hidden when a bag is closed.